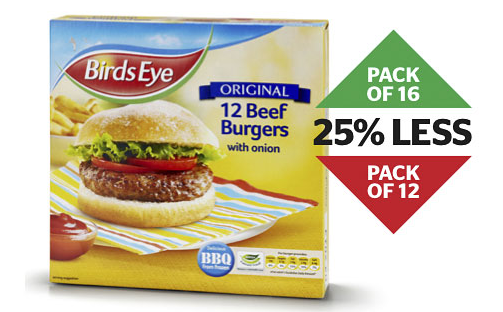 Some of the most popular household brands in British retail have been accused of shrinking their per-pack product sizes whilst keeping prices the same or even increasing them. Wondering why a pack of fish fingers isn’t stretching as far as it used to? Or why the dishes aren’t as clean after the dishwasher has been running for an hour? If a new study is to be believed, it is because big-name household brands are reducing the amount of actual stuff sold in each pack, but still charging you the original price for them. A survey by consumer group Which? found that Thorntons Caramel Shortcakes were £1.40 when they contained 12 cakes, and then £1.50 when they contained just 10. Similarly with Pledge household polish, which cost £1.30 for 300ml, and then stayed at £1.30 for 250ml. Even crisps (which are already the most expensive bag of air you’ll ever buy) were 49p for 34.5g, and then shrank to 32.5g at the same price. Which? said it had asked manufacturers why products were shrinking, and was ‘generally told it was due to rising costs’. The consumer group also found that ‘most’ of the manufacturers it asked said they did not reduce the recommended retail price when the changes had been made. This means that they are holding onto the cash – supermarkets are not getting the benefit. So it's a way of manufacturers staving off the aggressive pricing methods used by retailers. Thorntons even went as far as admitting that shrinking the amount of ‘stuff’ allowed for better promotions. Still, you can see why the manufacturers are doing it. In tough economic times, increasing volumes sold at the till is going to be a lot trickier than simply increasing the margin (and without really telling anyone) at factory level. Of course, Which? has got on its high horse talking about transparency and how pricing structures should be more obvious to the consumer (which is probably a fair point), but we’re not expecting a slew of cost price cuts from manufacturers. So if you’ve been thinking that all the snacks you enjoyed as a kid have shrunk simply because you got bigger, rest assured that you’re not going mad – they are getting smaller, too. If you want to get riled up about other brands that are giving you less bang for you buck, check out this page.